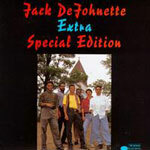 CD review: "Extra Special Edition"
Jazz drummer Jack DeJohnette is rightly renowned among fans for his forays into the unknown, for taking chances. His follow-up to 1992's "Music for the Fifth World"  which featured heavy metal musicians Vernon Reid and Will Calhoun  continues DeJohnette's explorative vein, while changing stylistic gears. While "Fifth World" was a hard-driving fusion of world beat, rock and post-bop jazz, "Extra Special Edition" is more straight-ahead jazz in style. But what keeps it explorative is Bobby McFerrin's unique vocalizing. There are few lyrics on the album, giving McFerrin (best known for his hit, "Don't Worry, Be Happy" a few years back) plenty of room to instrumentalize with his fabulous pipes. The sound effects he gets out of his throat are amazing  better than most synthesizers can generate. This album, more so than some of his recent solo recordings, shows what a fantastic jazz musician McFerrin can be in the right setting. But that's what DeJohnette does best  create an environment where his fellow musicians can make new and original music in complete confidence. Keyboardist Michael Cain counterbalances McFerrin's explorations with introspective acoustic piano passages that complement and challenge McFerrin (the interplay on "Then There Was Light," a vocal/piano duet, is awe-inspiring), while Paul Grassi's percussion combines with DeJohnette's own work on the traps to ground the whole effort.